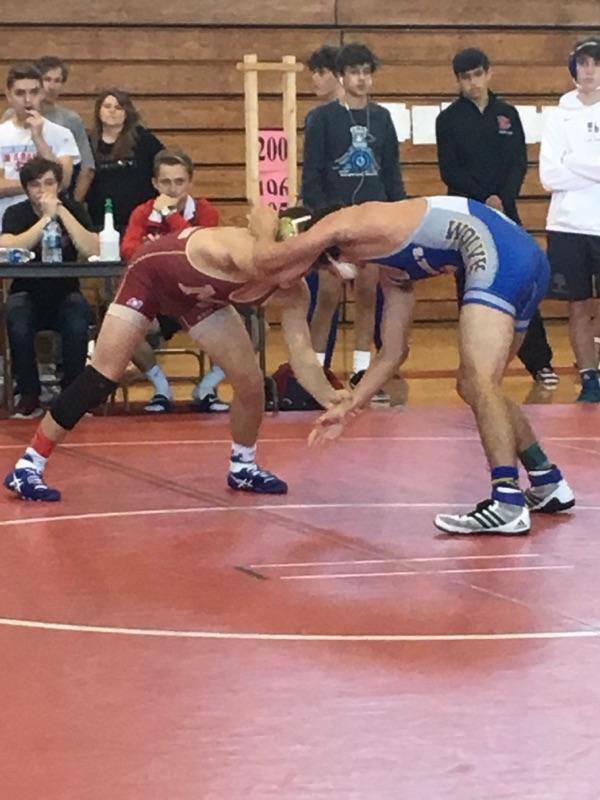 The results of two tournaments and four dual meets were entered into TrackWrestling on Saturday, November 4th, and one more dual meet was entered on November 7th. Nineteen teams from all corners of Louisiana converged on St. Michael the Archangel High School in Baton Rouge last Saturday for the 2017 Warrior Open. The champions, however, were limited to just five of those schools. 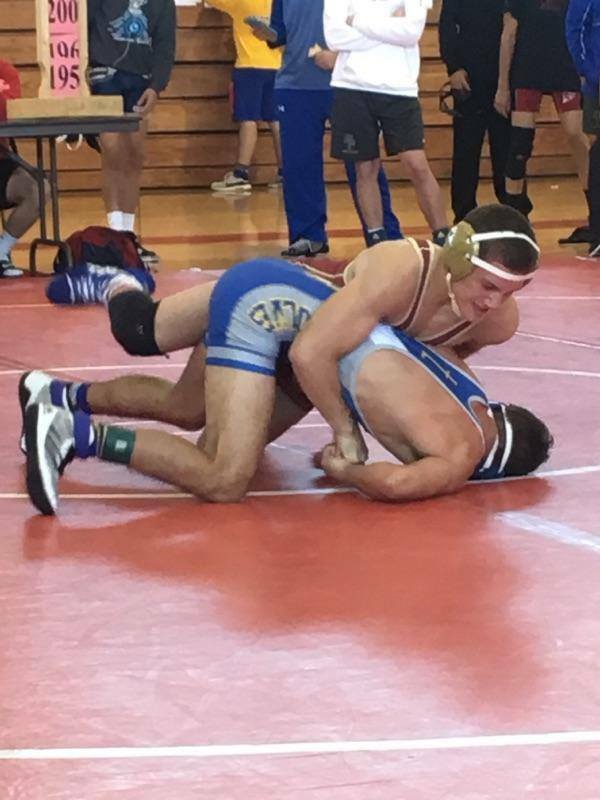 Live Oak and Ouachita Christian each had three first-place finishers. For the Eagles...well, that does not make much sense as both schools call themselves Eagles. For the Baton Rouge area Live Oak Eagles, Clayton Hill recorded a fall over Airline's Dakota Brace in 2:42 to win the 113 lbs. weight class. At 152 lbs., Live Oak's Camdyn Ingram, a Division II runner-up in 2017, defeated 2017's Division III runner-up Matthew Matherne of Ouachita Christian 9-5. Division II state champion Anthony Ingram needed little work to win the 285 lbs. weight class. Ingram won his three matches in a combined time of 3:35, 25 seconds less than it takes to wrestle two complete rounds. After pinning Catholic's TaaJuddeen Abdul-Salaam in a 40-second final, Ingram was voted the tournament's Outstanding Wrestler in the heavier weight classes. 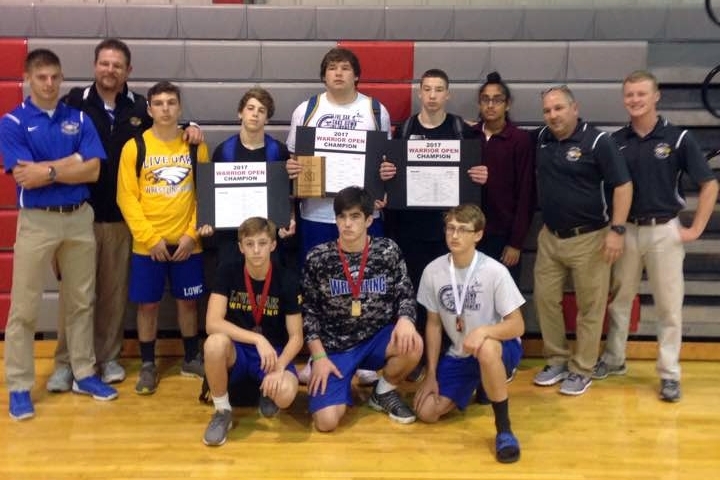 All seven Live Oak wrestlers placed in the top four spots. Ouachita Christian's first championship came at 106 lbs. when Griffin Barnard scored a 14-5 Major Decision over Jesuit's Max Holmes. The Monroe-area Eagles' next championship was won by Mikey Gordey in a 7-3 victory over Airline's Thomas Barringer. Matthew Webre won Ouachita Christian's third title with a 9-3 victory over Dutchtown's Zion Marable. When the event was over, seven of Ouachita Christian's eight wrestlers placed in the top four spots. 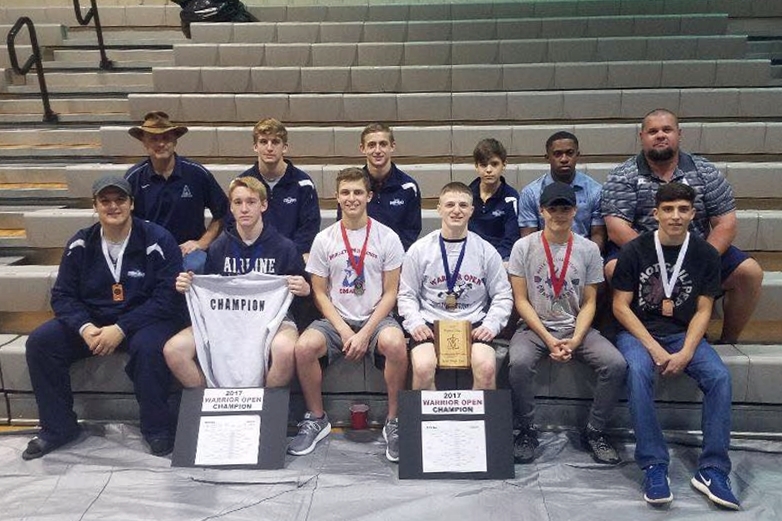 Airline High School of Bossier City sent 10 wrestlers to the event and won two championships. LEFT: The Airline team and coaches. CENTER: 145 lbs. champion Tucker Almond. RIGHT: 120 lbs. 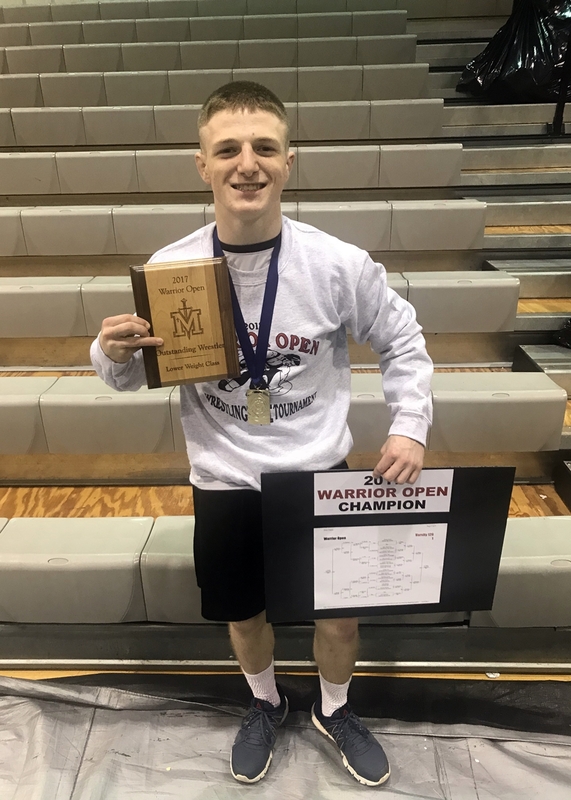 champion and lower weight classes Outstanding Wrestler Peyton Bass. 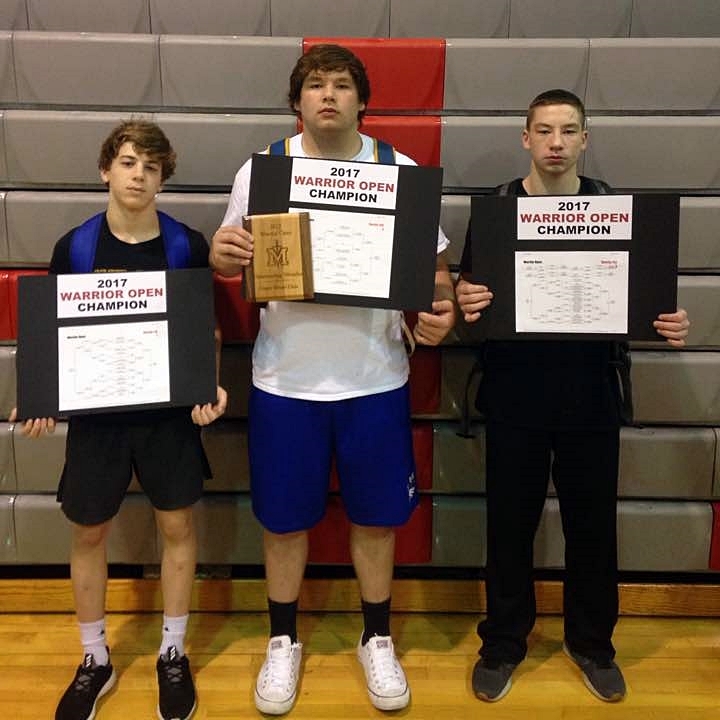 Live Oak had three champions, including Anthony Ingram, who was voted the Outstanding Wrestler of the heavier weight classes. LEFT: The Live Oak team and coaches. RIGHT: Eagles champions Clayton Hill, Anthony Ingram and Camdyn Ingram. Airline High School of Bossier City recorded two championships, as did Jesuit of New Orleans. For the Vikings, Peyton Bass defeated Catholic's Luke Romano via a fall in 2:30 in the 120 lbs. finals, and was voted the tournament's Outstanding Wrestler in the lower weight classes. Tucker Almond won Airline's second title over another Bear from Catholic, A.J. Sabine, in 1:36. Ben Dreuil of the Blue Jays won Jesuit's first championship with a pin over Live Oak's Dylan Merrill in 1:35. Colby Queyrouze won Jesuit's other title with a 5-4 win over Ouachita Christian's returning 2017 state champion Sam Pitts. With four finalists Catholic was bound to win one and it was delivered by two-time Division I runner-up Jacob Fereday. Fereday pinned Sam Houston's Mataius Lavine in 3:34 to win the 170 lbs. title. The pin was Fereday's fourth of the day. Devon Clark of East Ascension won the 220 lbs. weight class with a pin in 2:33 over Baton Rouge's Axel Encalada-Arce in 2:33. Caleb Michelson won a championship for Zachary and their new coach J.P. Pierre with a pin in 2:29 over Live Oak's Austin Cook at 182 lbs. Not to be shut-out, the host school's Dane Harter, a 2017 Division II runner-up, pinned Jesuit's Thomas Arceneaux on 0:57 to win the 195 lbs. weight class. Airline, Live Oak, Ouachita Christian and Jesuit each had two runners-up, while Catholic had three. No one can say St. Paul's is "easing" into the 2017-18 season. While several of the upper echelon programs have yet to put a varsity starter on a mat, the Wolves sent their best to the Raider 8 on Saturday and scored 258.5 points to win the event by a 94.5 points. A talented group of Brother Martin wrestlers, some of whom might very well make the varsity starting lineup later in the season, placed second with 164.5 points. Shaw, De la Salle and Belle Chasse sent their varsity squads, less football players, and finished third, sixth and seventh, respectively. A young Holy Cross squad (one eighth-grader, seven freshmen and two sophomores) placed fourth. 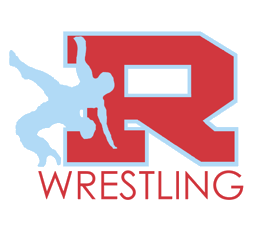 Host Rummel entered four starters from last season and placed fifth, but the Raiders were without the services of 2x defending Division II state champion Blake Mateu. (Two-time defending Louisiana Classic champion might better represent Mateu's caliber.) Brusly only sent three wrestlers. 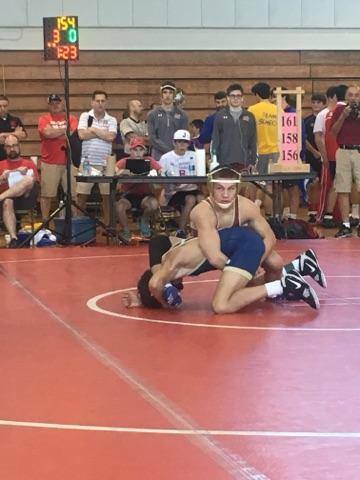 David Kent, the 2017 Division III 106 lbs. runner-up, placed sixth at 126 lbs., which was arguably the toughest weight class of the event. St. Paul's was led by their two defending Division I state champion seniors, Cole Houser (actually a two-time Division I champion) and Jared Thieler, who won titles at 138 lbs. and 152 lbs., two of the Wolves' seven championships. 2017 Division I third-place finishers Brandon Stein (126 lbs.) and Grant Hughes (145 lbs. ), fourth-place finisher Connor Oviedo (120 lbs. ), Evan Ulfers (160 lbs.) and Gavin Patti (285 lbs.) won the other five titles for the Wolves. Freshman Ethan Castex (113 lbs. ), junior Ross Mayer (132 lbs.) and senior Garrett Legendre (195 lbs.) won titles for the Crusaders. Shaw won two back-to-back championships. 2017 Division II state champion Martin Garrett won at 170 lbs. and was followed by 2017 Division II runner-up Eduardo Garcia, who won at 182 lbs. It was the eighth-grader on the Holy Cross team, Jacob Frost, who won the sole championship for the Tigers at 106 lbs. For De la Salle, Alex Ormond won at 220 lbs. 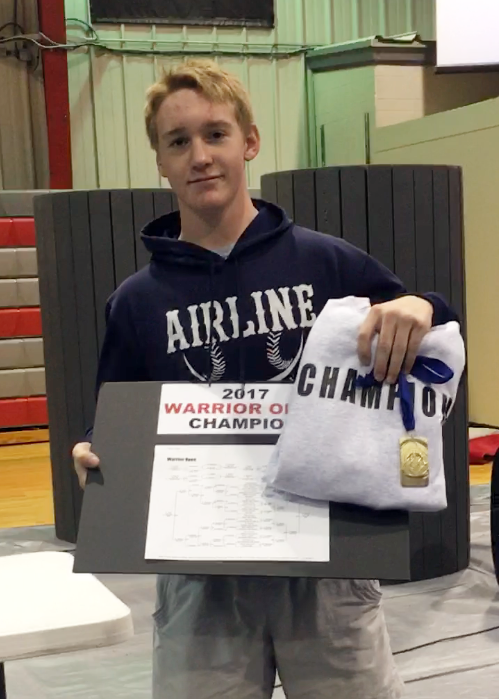 Sophomore Crusader Logan Bertot, who won the 2017 Ken Cole Invitational as a freshman, placed second at 120 lbs. in a close 2-1 match with Connor Oviedo of St. Paul's. On Halloween night, Catholic defeated East Ascension 54-24. Each team evidently found sales on Bears and Spartans costumes. On November 1st, a tri-meet was held at Belle Chasse. The Cardinals defeated the Bonnabel Bruins 51-21 and defeated NOMMA 69-6. Bonnabel defeated NOMMA 44-12. On November 7th, Catholic defeated Live Oak 39-33.